MILWAUKEE — The Christmas countdown crunch is officially on. With seven days until the holiday, the craze of shipping and shopping is at a peak as last-minute shoppers cross the final few names off their gift-giving list. “This is earlier than normal. I’m such a procrastinator. They’re lucky I’m getting them out now," Gary Grabarczyk said. Grabarczyk isn’t the only one running last-minute errands. Not only is Santa working overtime but his USPS delivery elves are working around the clock, too. This is projected to be the busiest week of the year for mailing and shipping. “I took advantage of the Black Friday deals nearby as well as the Cyber Monday deals, but I feel like I have to really go into the stores to really feel what my family might specifically like,” Ethan Brittingham said. Fortunately for Brittingham, this is the year of the last-minute shopper. Amazon has free same-day shipping on Christmas Eve for its prime members. 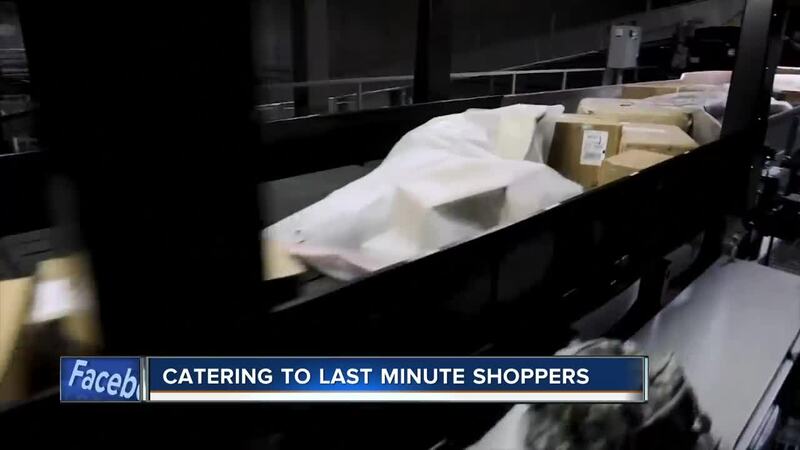 Retail giants such as Walmart and Target are pushing the last dates to schedule deliveries further back while also offering in-store pickup options on Christmas Eve. The recommended send deadline for priority mail is Thursday if you want the item delivered by the postal service before Christmas Day.